Sometimes when I'm in the kitchen, I'm just preparing a meal. But, there are times when I'm really cooking. 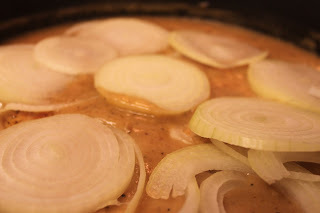 And, when I'm standing over a skillet, my face bathed in steam, working on a batch of homemade gravy...well, that's cooking! If my husband had his way, I would cook this every week. Fortunately, I do things my way when it comes to the kitchen. Besides, if I made it every week, it wouldn't be special. And, I like to keep him begging for more. This is seven pork chops that I sliced from a pork loin. I fried all of them and set one aside for my five-year-old son. He's not really into smothering. 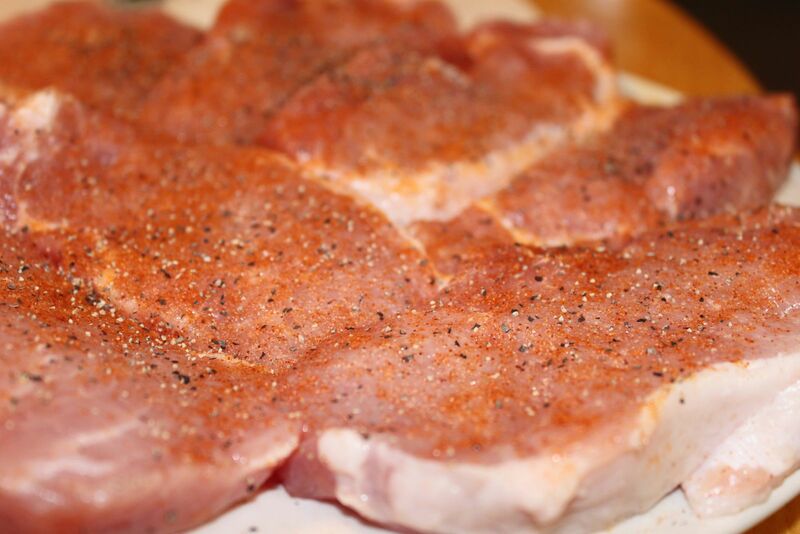 I sprinkled them with my favorite seasonings: seasoning salt, garlic salt, and course black pepper. I dredged the pork chop in flour. I saved this flour to use in the gravy. I fried the chops in about a half a cup of canola oil on medium high heat until cooked through, about 10-12 minutes. I turned the chops to cook evenly on both sides. 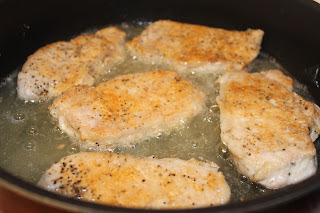 Because I had more chops than I could fit in the skillet, I cooked in two separate batches. When the pork chops are done, remove from oil and set aside. At this point, you can stop and serve them. 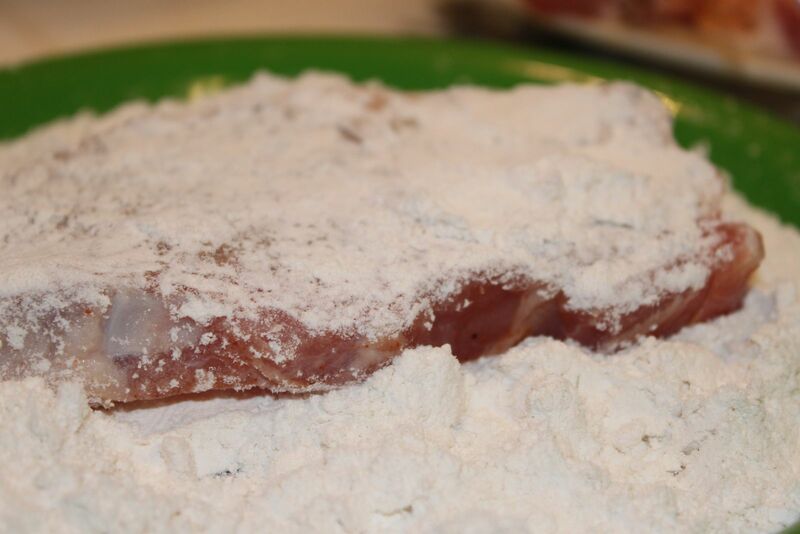 Congratulations, you have fried pork chops. 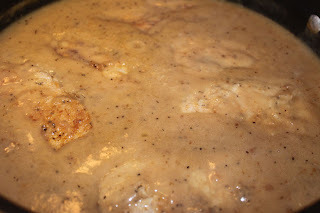 But, if you're brave enough, continue on to the gravy-making process. 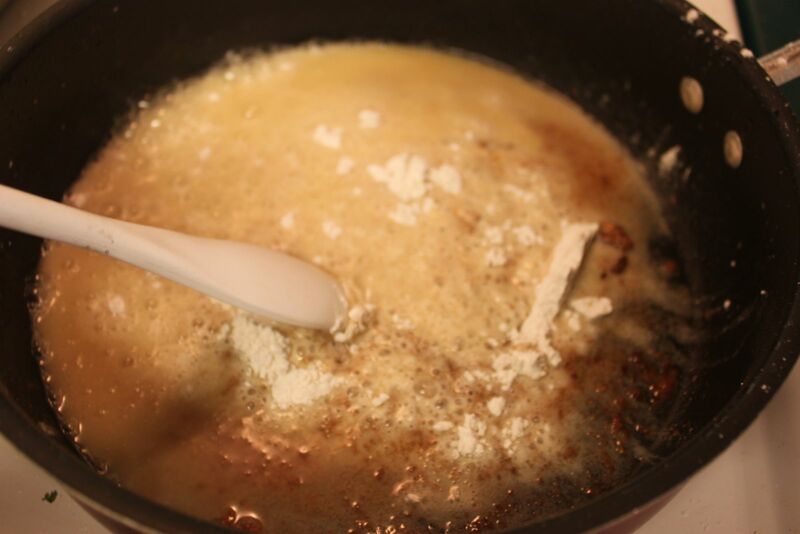 Now, you need to see how much oil is left in the pan and use an equal amount of flour to make your base. 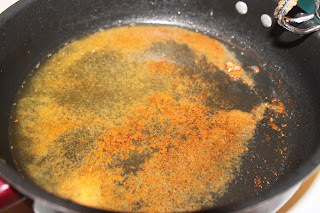 Here's what my oil and drippings look like. I have them on medium heat. I added the flour and stirred until smooth. 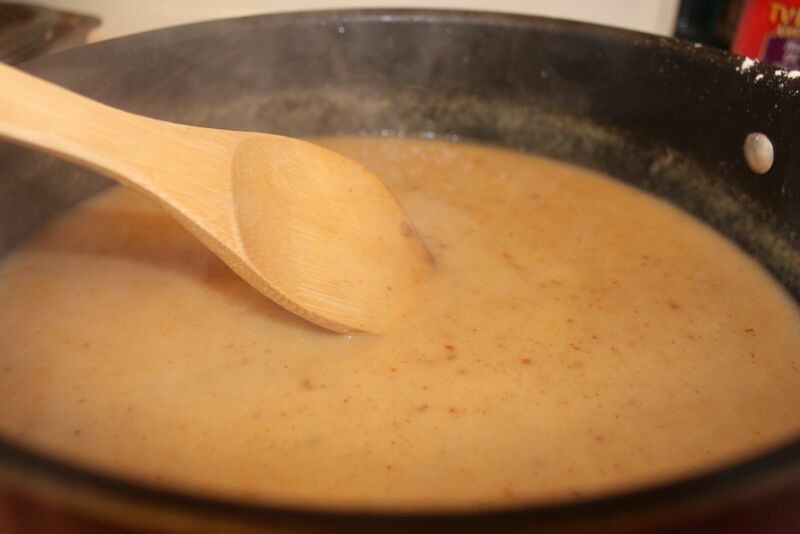 Cook briefly until it reaches a nutty brown color. Some of you may notice that I'm now using a wooden spoon. Do not use a plastic spoon to stir your gravy. I had to learn this the hard way and now I'm down a plastic spoon. Do as I say, not as I do. Next, add about two cups of chicken broth. The mixture will be bubbly and thick. Continue stirring. Now, gradually add in a little more chicken broth until the mixture starts to thin out. 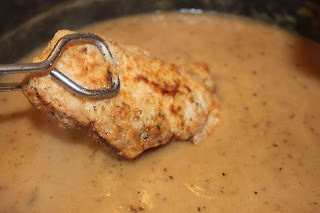 I like to go a little thinner than traditional gravy since the mixture will cook a little longer once the pork chops are returned to the skillet. 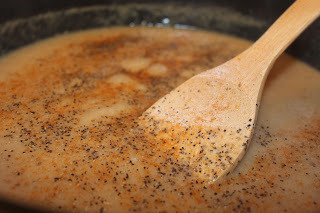 But, you should decide the consistency of your gravy. It should take between 3-4 cups of broth. Before I return the pork chops to the gravy, I sprinkle on the same seasonings that I used on the pork chops. 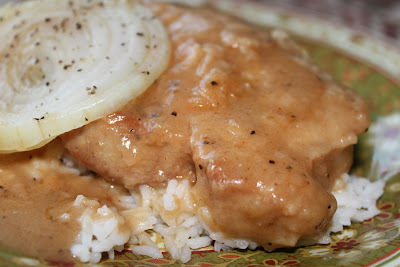 Now is the time to taste your gravy and adjust the flavors. I dip each pork chop into the gravy to make sure both sides are covered before smothering it in the gravy. 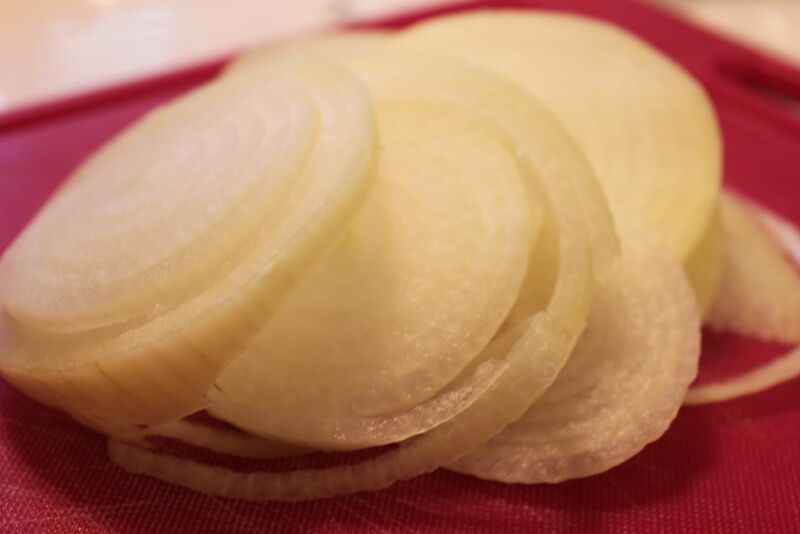 No, I didn't forget about the onions. That's my husband's favorite part. Lay the sliced onions on top of the gravy mixture. Cover with a lid and cook on medium low for about 20-30 minutes. That will give you just enough time to cook some rice. You will need it to soak up the luscious, golden gravy. Now, if you can wrestle this away from my husband, you're welcome to try a piece. But, I think you may be better off cooking your own. Enjoy! Thanks Christina. 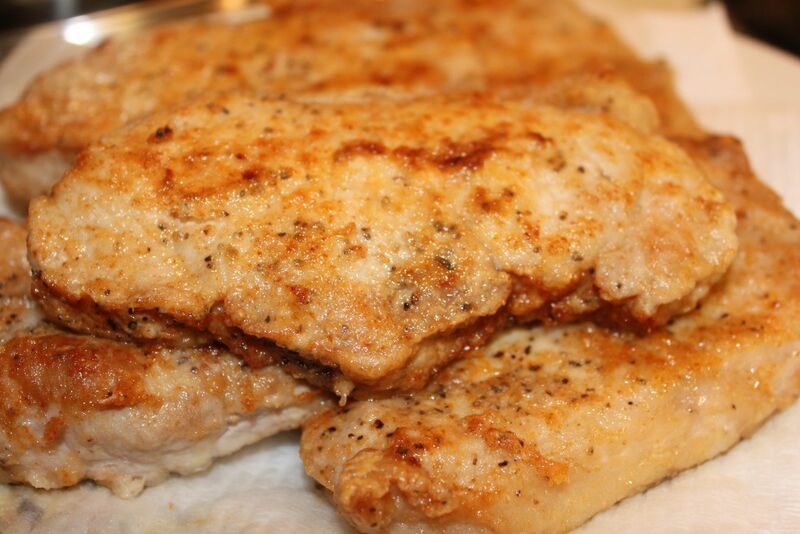 This recipe can also be made with boneless chicken breasts. Just as delicious. It's getting really cold up here in the North and being that I fare from the South this will warm us right up! Thanks, looks delicious and perfect for someone like me who eats onions almost everyday!